I've decided to take a break from the blog. I've been posting pretty regularly since August 31st of last year, and I just think it's time. I appreciate using this blog as an outlet to share information and reflect on my thoughts and experiences. I hope you have been able to learn a few things from the blog. I really want to help people, and this blog was one way I was trying to do that. If you've taken the time to read my blog, I really appreciate that too. There are a ton of blogs on the internet, and if you're reading mine, that's really cool. I'm not done with the blog, but I don't know when I'll be back. Maybe at the end of the month? I'm not sure yet. It's been fun to work on my writing and thought development. It's also been fun to connect with people of similar interests on Twitter. Another U.S. Holiday, the Fourth of July or Independence Day. There are a lot of things to think about when planning to travel and see family. Below are some things to think about, but it's not a comprehensive list! Busier highways/interstates. You're not going to be the only one traveling. Is your car running? Plane tickets purchased? Does your family or do the in-laws even know you're coming? Is my pet going to be scared of the fireworks? Will shooting off fireworks annoy/bother my neighbors? Do I have life jackets for my boat? Do I have a designated driver? Do I have the local TAXI company phone number? Is there UBER in my area? Will it be busier due to the holiday? We can't plan for everything, but at least having a plan can help decrease your chances of something bad or unexpected happening. Whatever you do, don't drink and drive, and don't let someone you know drink and drive. The link above is to an (inspirational) comic. It basically said that with how connected we are, we see more bad stuff than we should. This comic really stood out to me, because I've been reflecting on what I read online, and it's really true. I left a blink-182 fan group on Facebook because a lot of people in it were fighting and arguing. This was supposed to be a group for fun, and it was making me sad and anxious. I left the group and I've felt better since. I catch up on politics on most week days, and that's full of wonderful news (sarcasm). I know any election cycle is bad, so I'll have to keep that in mind. Just remember that news/media are a part of corporations looking to make money. They'll use click-baity titles and shocking news titles to get you to watch and read. So I'm going to unplug more. Maybe stop reading election news. Leave any forums/groups/online communities that are full of drama. Does anyone else stress eat? I do. I could probably minimize this by planning out all of my meals, which I haven't done yet. I am making a little bit of progress on that end though. I know I'm not losing any weight because I'm taking in too many calories, and I'm not exercising enough calories away. I have identified the physical reason for not losing weight. As far as the mental reason goes, I have no motivation. I talked about this a few weeks ago, and I still haven't found any. I'll keep looking. My kitchen has opportunities to be better. I'm slowly getting the dish ware/cookware I need to be healthy. The next step will be learning a variety of recipes. Also, part of me has the mental block that makes me think I can't get and stay skinny. My attempts to lose weight always result in my gaining the weight back. I like the feeling of being full. I've identified a lot of issues, and I need to continue to keep working on solutions. If you have any tips, let me know! I liked doing weekly Missions for awhile, but then I stopped liking them. It felt like homework, and I needed to find a new way to pursue these Missions. I still haven't given much thought to how to improve them, so in the meantime, here is a weekly Mission! Minimalism - Due an inventory on my pants/shorts. Investing - Look for any good stock deals due to #Brexit. Technology - Finish transferring over all essential apps to my new phone. Conservation - Order a replacement nozzle for my re-usable water bottle. Health - Don't drink anything but water after 5 PM. I got some news last week that my 17 year old cousin has a brain tumor. The scan came back to show that the tumor was benign (so the tumor is "harmless"). My cousin was having bad headaches and went in to the doctor to see why, and now we know why. My cousin will have to have major surgery to remove it, and it's very scary to think about. I trust that the doctors/surgeons will do their best. I trust that they'll use the best and most trusted methods to remove the tumor. I'm hesitant to say that I'll pray concerning this situation. I don't want to talk about religion a lot on my blog, but it seems counter-productive to pray to a God who let this tumor happen. Tumors and cancer is terrible for everyone, but children getting cancer? Come on.... that's especially terrible. Give us a chance to live our lives before health issues take hold. Things like this can and do happen all the time. This is a huge reminder for me to appreciate life and go and do things that I want to do. If your stocks were "red" today, it was most likely to do "Brexit", the British exit from the European Union. I have two shares of Qualcomm and was paid $1.06 in dividends from them this week. Getting a payment over $1.00 is super cool! I've added a new column to the year-to-date update. The farthest column on the right is titled "Average/Week". What I wanted to show with this is that investing doesn't just belong to rich people. I completely understand $37.00/week is still high for a lot of people, and I'm not going to add money again until my average gets down to $25.00/week. Don't take running water for granted. I was reminded of this today. I came back to find my apartment to find that the water wasn't working. I got a notice saying it was going to be shut off for part of the day next week for maintenance, so I was concerned that this was happening so soon. I'm currently without running water, but the maintenance staff made accommodations with me to use a neighboring, empty apartment, to use the sink, toilet, and shower. I feel I'm pretty grateful for my current living conditions, considering what I've been through. I've lived in some pretty crappy apartment situations before, and I don't believe I've been unappreciative of my current place. It's still a nice reminder to be grateful for having running water. It's surprising how much we rely on running water. I can't do laundry, wash my dishes, use the toilet, take a shower, or wash my hands. It should be fixed tomorrow, so at least it's a short term inconvenience. We should probably all use less water anyways. I'm sure we've all heard the statistics on water usage for showers, and how showers use a lot of water. It seems that every few months we get news of an impending water crisis, and then the news goes away. My water being turned off also reminds me that I should get a disaster kit ready. I need to get a kit with batteries, flashlight/s, hand-crank radio, water, canned goods, and a first aid kit. So yea, I'm definitely not going to take running water for granted again. P.S. a new blink-182 song came out today! I really like it! My friends got me hooked on a game called Clash of Clans back in December. I initially started playing it to "hang out" with friends, and I've grown to really enjoy the game. I know I'm kind of late to the game, as some friends have been playing it for awhile, but that doesn't bother me. I used to play World of Warcraft a lot, which requires you to physically sit at your computer. The thing I like about Clash is that you play it on your phone (or tablet). You don't need to be physically stuck inside your house to play and check on the game. My friends and I used to play World of Warcraft for hours on end. I could never join a "raiding" guild (basically a team of people assembled to fight super hard monsters in the game), because I couldn't devote 3 nights of week of sitting at my computer for 2-3 hours. I have other stuff going on. With Clash, I still get to play a game with my friends, but I'm not stuck in my house. The other thing I like about it is that if you have a smartphone that was made in the last 3 years, you'll have no problem with playing the game. I never played World of Warcraft on a super nice computer, and a lot of my friends played on nice computers. Clash is a level playing field for game performance if you have a smartphone or tablet. I don't play a ton of games on my phone, but Clash is definitely one of them. I slept pretty well last night. I'm finding my right ear is plugged when I wake up in the morning. My entire life I've slept on my right side (so right ear is faced down towards the bed), but now I'm thinking I'm sleeping on my left side (right ear up in the air). I think my concussion may have altered my sleeping pattern :( With my right ear facing up, gravity and time do their work on my ear, and I wake up with a plugged ear. I have had problems with my right ear ever since some moron dropped his weights right next to me while he was doing deadlifts. The sound of the weights dropping pierced my ear and it hasn't been the same since. Work was good today, and after work I went to the grocery store. I never really have a plan when I go to the store, so it's not very organized and efficient. But I enjoy going to the grocery store. I think this enjoyment comes from enjoying shopping while I was working my last job. I really had no friends outside of work, and nothing to do at night, so going to the grocery store was something I enjoyed. It was nice to be around other people, and it was a necessary errand to do at the same time. After work, we had a work-dinner get together. That was a lot of fun and I enjoyed that. After that I went for a walk and ran into a friend of mine. I didn't get as much done tonight as I wanted, but I got to be around people, which was well worth it in my mind. While at the dinner get together, my coworker/friend had a vase with a branch of a plant growing out of it. I will have to do this for my pothos plant, as I want to grow another plant from it. I'm going to do an appreciation post tonight. I have nothing majorly wrong with me physically right now. I'm feel 95% recovered from my concussion, although my head still feels weird sometimes :( My other aches and pains are pretty minimal right now. I have no major projects due and I feel good about work. I talked to a good friend tonight about his work situation, and feel confident I was able to give him some good advice. It's also beautiful outside with no snow, so that is always good. My spending is under control since I put myself in a "No eating-out for a month" plan. I'm almost completely migrated over to my new phone, and it's working great. I don't know, I'm just in a good mood and trying to be grateful. Whenever crappy things happen, I regret not appreciating the good times, so I'm doing that now. I've noticed recently that social media is filled with people trying to make a point. Politics, sports, movies, music etc.......it feels like we're all trying to make a point. MY team did this. MY favorite movie is coming out. MY band is better than your band. I find myself "stuck" or "fixated" on this sometimes. What can I say to prove that MY stuff is better? What can I say to show people MY interests? I need to let go of worrying about this. People are so much more confident behind a computer screen, and I believe they become more argumentative online. I need to quit worrying about this. Letting go of this will add to my happiness. I love the Golden State Warriors basketball team. I'm very sad they lost the finals tonight. I became a fan after watching them in the playoffs/finals last year. I became a fan after seeing how well of a TEAM they had and how professional they acted. I was also very glad they beat LeBron James, who I haven't been a fan of since his big Miami Heat celebration. I followed the Warriors all season long. I've never done this with a basketball team before. I stayed a fan, again from seeing the TEAM dynamic and their professionalism. So yes, a "band-wagon" fan, but I'm with Golden State now until Steph Curry retires. I think I mentioned this during football season, but sports can require big commitments. These commitments can be in the form of time, money, energy, and mental energy. If I'm striving to be a minimalist, do I need to better balance my love of the Golden State Warriors? If I don't watch basketball next year, I save myself time, save myself from advertisers trying to get my dollars to buy their stuff, I save myself from gossip on which player is doing what, and I save myself on potential frustration. I'll also miss out on fun and comradery with friends. I don't think I was over the top this year with being a fan. I could have been a lot worse. I'm probably going to stop paying attention to basketball for a couple of weeks, then start paying attention again. Technology - You can now send text messages through the Facebook Messenger app. There are quite a few texting apps, along with internet-messaging apps, and now you can use both through the same app. I believe this is Facebook's way of making you use their product more than others. Now I'm just waiting for Facebook to implement their version of Snapchat, and I think Snapchat will be dead. I installed Pushbullet last night. Basically, with this app, I can send text messages through my computer, which is really awesome! Health - I haven't been drinking a lot of pop, and in its' place I've been drinking carbonated water. I've also been preparing my own food, which will ultimately help me be healthier. 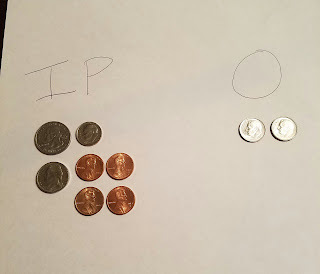 I didn't really follow stocks this week, but my overall portfolio value went down. Below, you'll see I've visually presented the dividends I've received this week. House foreclosures definitely drop your credit score, as I have found out first hand. My realtor tried to use the drop in credit score to scare me into selling my house for less than I could afford. Maybe for my realtor, a drop in her credit score would have been the end of the world. For me, walking away from my house was also the end of the world for me. The end of a world that was full of sadness, loneliness, and being bullied. It felt great to quit responding to evil Wells Fargo. It felt great to block my realtors' number, since she tried calling me to sell my house after I pulled the house from the market. I took control of my situation. I decided what happened. My former house was the last thing keeping me tied to my old job and life, and now I can fully move on. Like I've said before, a credit score is imaginary. It's not a physical thing. Cash in your pocket (not getting technical into cash being legal tender in place of a gold system, or lack thereof) is a physical thing. I'm in a position where I can take a hit on the credit score. But even so, it's back on the rise. I'll see if the score continues to rise, and if it does, awesome. If it doesn't, oh well. In summary, the house foreclosure dropped my credit score, but it's already back on the rise. I made my own dinner tonight and I feel good about it. I was out with a friend this evening, and I could have gotten fast food, but I resisted. I waited until I got back home to eat dinner. I know most people cook for themselves regularly, and this isn't a big deal, but I'm going to celebrate it. I cooked chicken, and I even made enough for lunch tomorrow. This is a small step in the right direction preparing a lot of healthy food in bulk. Before I go to the grocery store next, I'm going to pick out 5 recipes from www.budgetbytes.com that I want to eat. I will buy these ingredients at the grocery store and make enough food to last me for a week. I'm refocused on losing weight, especially after seeing myself in a video I recently made. It's obvious I've gained a lot of weight since last summer, and I need to lose weight! I've spent way too much money in the past few months. I've basically said "Screw it!" on food and spending, and now that I'm looking at the actual numbers, I need to make a change. I've tried tracking my own stuff on excel, and I never keep up with it. I'm going to try using "Mint" again. Mint, https://www.mint.com/, will pull your transactions from your bank account and organize them into charts, and compare them against a budget which you can make. It's pretty much everything I'm looking for, except I'm using MINT, and their website, to log in to my normal banking site. I used to have Mint, and this is why I quit using them. I was worried my account information wasn't secure with them. There website security information looks pretty good, and let's be honest, with as much hacking that's going on these days, our banks probably aren't even that secure. After looking at how much I've eaten out in the past few months, I'm putting a stop to this. Today, June 14th through July 15th, I will NOT eat out. Now, I'm usually not so rigid with these attempts that I'll let it affect me physically or mentally. If I absolutely need to, e.g. I'm out of town, or driving a long a distance, and the only thing that is around is fast food, I'll eat it. If I'm at home though, I'm going to eat food that I make in the kitchen. Let's save some money, eat better, and lose some pounds! I haven't talked about Robinhood for awhile, and maybe that's a good thing. I'm very happy with the app, and I have 0 complaints. Since I've gotten my new phone with the fingerprint reader, it's a breeze logging in and checking Robinhood. It was already simple with a passcode, but the fingerprint reader is awesome. I've really had no problems with bugs or glitches. As of right now, Robinhood is only available on Android or iOS. I imagine that the range of problems that the Robinhood Support Team has to deal with is narrow due to this "limited" platform availability. I put limited in quotes because there are very few people I know that don't have a smartphone. I have great faith in the company, and it gives me hope that American companies can still innovate and come up with great products. This app brought trading to lots of people who couldn't grow their money with E*Trade or TDAmeritrade with their $9.99/trade commissions. Like I said at the beginning, I haven't talked about the app a lot lately. The app works great and I'm a very happy and loyal customer. Aside from that, I don't have much to say! Here is a link to their blog, in case you want to see what's new on their end! I have a concern with falling behind on technology. Due to this concern, I've been trying to keep up on the latest apps. I don't necessarily use all of these apps, but I'd like to be aware of what is popular right now. 1. Facebook Messenger - Not installed. 2. Facebook Moments - Not installed. 3. Slither.io - Not installed. 6. Pandora Radio - Not installed. 7. Instagram - Not installed. 8. GO Speed - Not installed. 9. T-Mobile Tuesdays - Not installed. 10. Chick-fil-A - Not installed. I have 2 apps installed out of these 10. I currently have 58 apps installed on my phone. I am currently completing my 2016 Mission of having 100 apps or fewer on my phone. The past couple of weekends I've cat-sat for a good friend of mine. My friend got her cat from a shelter, and the cat is so fun and loving. When I go to check on the cat, it's so nice when she greets me at the door and lays down for a belly rub (yes this is a cat, not a dog). I usually then check her water bowl and food bowl. After that I play with her toy mouse and let her pounce and "catch" it. After we play, we sit on the couch and I pet her and she usually takes a nap. 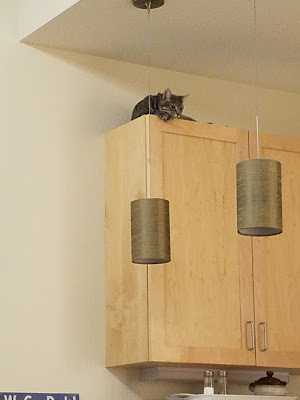 Whenever I see the cat, I remember that my friend rescued her from a shelter. It's a good deed that my friend did, and it's a good deed any time someone rescues an animal from a shelter. It's also good when people continue to take care of the animals after they rescue them. There is a lot of suffering in the world for all living things. I reminded quite often that I need to help people and animals. The sooner we can take care of animals off the streets, the sooner we can start taking care of the rest of the animals. The picture attached is when the cat was misbehaving a bit and was climbing on the cupboards! She eventually come down, but it took a lot of coercing! I received a dividend every single day this week. I've been saying June is going to be a big month, and it has been. Stocks went up again for I believe a third week straight. Since last August, every time stocks go up like this, they tend to go down shortly after, but this is just my personal thought. $3.70 in dividends this week! Summer 2010 - summer during college, I had a lot of free time since I was only taking 2 classes and not working. I watched The Biggest Loser a lot (which I guess isn't actually that ethical of a show). I ran a lot that summer and ran a 5K race. Summer 2013 - I was in a new town and didn't have a lot of friends. Also my girlfriend of 4 years and I broke up, so I started running to take my mind off things. I also met a girl who I was trying to impress, so I kept running to lose weight. Summer 2015 - I was super depressed from my crappy job and didn't have an appetite (not healthy). I barely at anything. So 2 summers of healthy weight loss, and 1 summer of very unhealthy weight loss. I had two summers of motivation and now I have none. I know being over weight is going to lead to health problems down the road, yet, I still don't seem to care. I need to get over this mental block and/or find some motivation, and start losing weight. 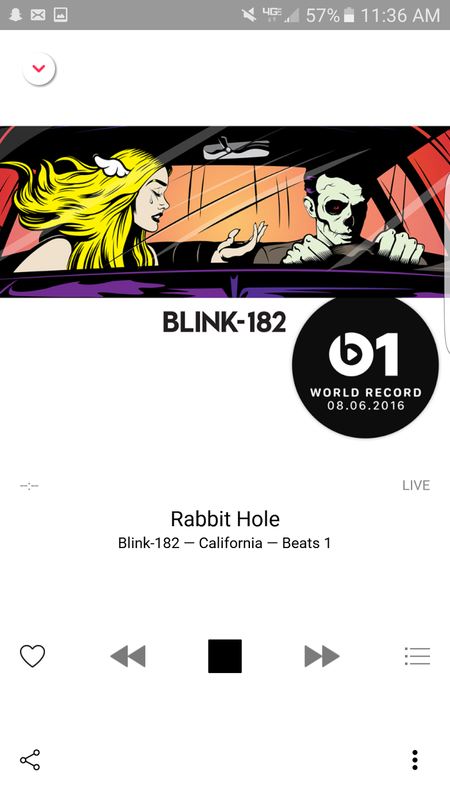 Blink-182 has recorded a new album and it will be released on July 1st, 2016. They released their second full length song today on Beats 1 radio. Apple makes things "exclusive" and it makes you want their items and to be a part of their group. By having this world premiere on Apple Music and the Beats 1 Radio, those who don't have iTunes or the Apple Music app couldn't listen to it live. Not to mention setting up a payment plan (even if you immediately cancel) to listen to Apple Music. Now we're in the great age of technology. Within a couple of hours, the song was available from the official blink-182 YouTube channel. There were also streams posted shortly after the song was released (which were taken down due to copyright laws). The point I'm trying to make is that it frustrates me that Apple still gets to be the "exclusive cool kid". From a business standpoint, it's great! From a user standpoint, it's not so great. I've experienced this when wanting to watch Apple presentations live, and this has to be done on the Safari Browser, or through some "i" device. I did not like the Beats 1 radio. Having a live DJ was cool, and after that it stopped being cool. I did not enjoy the music, and neither did many of the blink-182 fans who were also listening in just to hear the new blink song (source - blink 182 subreddit, haha). I won't be using Beats 1 radio again. I'll wait the hour to hear the song on YouTube, Google Music, or some other source. On Saturday night I was able to watch blink-182 play live at the X-Games in Austin due to Periscope. Periscope is an app, made by Twitter, that allows users to live stream video. ESPN stopped covering the X-Games before the concert began. There haven't been a ton of live concerts of blink-182 in the last year-and-a-half, so I was excited to watch this. I wasn't sure how I was going to watch it live, and eventually figured I'd have to watch it on YouTube the next day. I did find a link to a Periscope stream of the concert, and it made my night. I talked about live streaming last fall, and had high hopes for it. Facebook is a dedicated section on their web browser version for live streaming, and it's pretty easily built into the Facebook app. YouTube has live streaming, although I'm still not sure how the average user uses it. Snapchat is sort of "live", from a certain point of view. Basically, social media is embracing live streaming. Picture this - it's 2019. You have the iPhone 9 or the Galaxy Samsung S9 phone. You are on a 5G LTE network. Your smartphone has a 8K resolution camera. You are at a concert, game, or other cool event. You'll be able to live stream this event, to anyone you want, and the viewer will get to watch this event in pretty darn good quality. This is going to negatively affect the big sports networks. Why would I pay extra for sports channels or sports packages, when I can watch stuff for free being live streamed. I can only imagine the damage control big networks will try to do to prevent people from live streaming so they don't lose money. In writing about my former career, I didn't really know how many posts it would take to tell the story. I feel if I expand this out over too many posts, some of the message will be lost. I will summarize and condense as much as I can into this post. RECAP: I was in a job that was expected to take a promotion when one came available. The assistant to my boss was in a good spot to get my boss's job, and I was growing to dislike the assistant to my boss. So the assistant did get the job and he became my new boss. This opened up the job for the assistant to my boss. The person that got this job was someone that I had limited interactions with, but knew this person to be unkind, selfish, and tried to make themselves seem more important than they actually were. We'll call this guy "Big Head". So Big Head became the new assistant, so their job opened up for me. I called Big Head before moving to the new facility to see how their file system was set up at the plant, because I needed to know where all of the files were saved at to ensure a smooth transition. Big Head didn't have an organized filing system, which is crucial to our job, and this was a HUGE red flag. I specifically asked for a file that I needed to work on, which was saved on their local drive, and NOT ON THE NETWORK DRIVE, and they said it was my problem I couldn't access the file. Big Head was a bully, and they intimidated me. They would shut the door to my office and intimidate me. They would sit between me and the door, so I couldn't leave. This person was not a mentor. Big Head would question everything I did, because they knew I was doing things the right way, and they were still doing things wrong, even after working at the company 1.5 years longer than me. My new boss wasn't much different. He would also intimidate me. I wanted to quit 2 months into the new job. I didn't think I could because the company moved me, and I signed a contract saying that if I left before 1 year, I owed back moving expenses. My boss let me out of this contract early because he knew I'd be gone at exactly the 1 year mark anyways. There were a lot of other factors that led to me hating my job, but here are some things I ultimately learned. Be cautious of moving expenses and contracts. Be a minimalist to remain flexible and agile for relocating. Report any and all bullying/intimidation attempts to Human Resources/Personnel IMMEDIATELY. Keep the resume updated and keep connections fresh to keep an eye out for jobs. Set clear expectations with your boss, and also expectations with the boss on how interactions with co-workers should go. Do not be trapped inside a room with someone where there's no windows or door windows. This makes it so much easier to be intimidated. Choose a job or promotion only if it feels right. Do not ignore warning signs. I realize this is a longer post than I normally write. Thanks for reading. If you're in a bad job, just keep fighting and rely on your support system until you can find a new job. 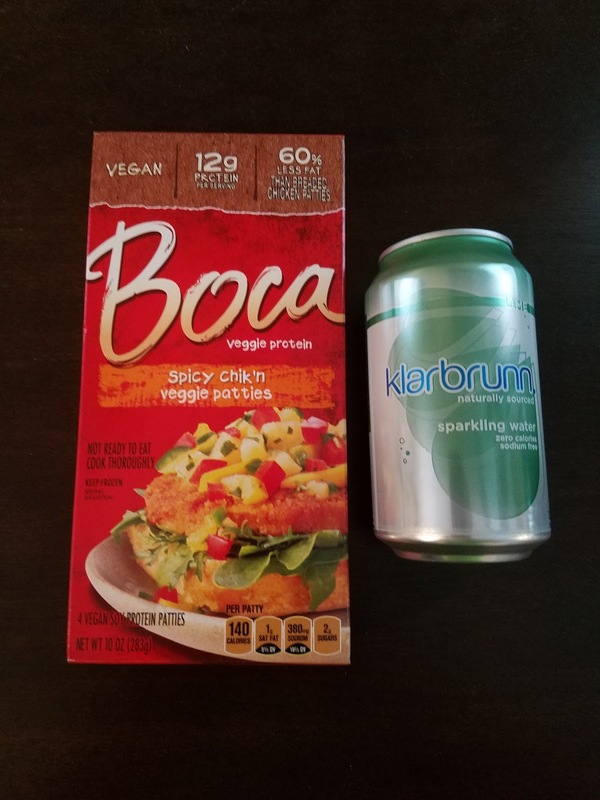 I tried being a pescetarian earlier this year, so I needed to find foods to take the place of beef, chicken, and pork. During that time I tried plant-based chicken patties and beef patties. I am not a pescetarian anymore, and am eating regular beef again. I'm still trying to cut back on chicken and pork because I think chickens and hogs live crappy lives before they're slaughtered for food. I've been eating these chicken patties now for a few months and I like them. I can pop them in the microwave, so they're easy to make, and they taste good. The same brand has hamburgers as well, although those don't taste quite as good. These chicken patties cost me about $3.99/box, which has 4 patties in it, so $1.00/patty. This coming week I'm going to try drinking less pop and try drinking carbonated water instead. Like I mentioned in a video blog, I don't have many vices - I don't drink alcohol or smoke, and I'd classify drinking pop as enjoyable. I'm hoping that drinking something that is cold, carbonated, and has some flavor, will help me drink less pop. When picking up vegetarian or vegan processed foods, I am worried about the sodium content. The nutrition facts for these patties are - 1 Patty has 4.5 g of fat, 380 mg of sodium, 13g of carbs, 12 g of protein. The sodium content isn't the greatest, but it's still going to be the same or better if you ate a breaded chicken patty from anywhere else. Tonight I'm going to talk about the following 4 apps: Watch ABC, CBS, FOX NOW, and NBC. I'm not going to go super in-depth, but I'm going to talk about things that I find important. --Started with 35 second ad, started with picture of Galaxy S7 phone ad from Samsung, then an ad from Netflix. --No account needed to watch free stuff. --"Preview Pass" available for an hour once I started watching Bones, with a box at the bottom saying I should sign in. --Box popped up on the screen to "verify now" to continue watching. After clicking, it takes you to a point to log in with TV provider information. 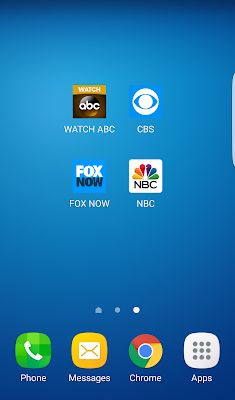 Based off my short time on each app, I would say ABC is the winner and FOX and NBC are the losers. With the ABC app, I started watching Bachelorette and Fresh Off The Boat without having to sign in or getting a notifcation I was running out of free time. FOX and NBC are the losers because of having to sing in with an account to watch video.